With an 8% incline in the overall competition from last year on Amazon, you can interpret that sellers are using different strategies to make their Amazon product listings rank and perform better on the marketplace. They modify their prices often, research, and scout for different products efficiently, enhancing their marketing tactics to carefully align with their selling objectives, and automate the business process in a way to increase profitability. According to the latest reports published by Statista, Amazon generated a total net sales of 56.6 billion USD in its last quarter, up from 51.04 billion USD in its preceding quarter. With this data, it is evident that Amazon will continue its growth, making bigger opportunities for third-party sellers on the e-commerce pulse. So, the more the sellers, the higher the competition. Hence, as a seller, it is vital to understand how to create and optimize product listings that can drive more traffic and convert better. Also, it is even more vital as a seller to comprehend what other sellers do on Amazon marketplace. Doing this will help sellers learn to acquire more visibility, identify the room for improvement and development, and unveil tricks, practices, and tools that other sellers are using to perform better. On that note, let’s learn in depth about Amazon SEO and what guidelines to follow to optimize your amazon product listings so that they have higher conversions. How To List A New Product On Amazon? How To Optimize Your Product Listing? Like search engine algorithms, even Amazon has its set of rules to rank its products based on the queries users type. Amazon’s product search algorithm, popularly known as the A9 algorithm is something that is most talked about sellers and experts these days. The Amazon A9 algorithm is an efficient and iterative search methodology that reads, scans, and analyzes all the data on the Amazon marketplace. It is a form of AI (Artificial Intelligence), which algorithm determines the products that are ideal matches for a customer’s query and ranks them with the most relevant on the top results. One of the A9’s principles is relevancy and Amazon strives to obtain the best results for its users. Their ranking algorithms are designed to automatically combine different relevance features. The structured data in their catalog provides them the necessary features required to present the best results to its users. The algorithm also learns from its former search patterns and adapts to display the important results to its customers. As said above, “relevancy” plays a vital role. It is a valuation done to check how good the content of your product listing is (i.e. product title, description, features). It shows the listings on the top results if its content matches the search terms or keywords searched by the users. Now, the better the text relevancy, the higher the rankings. This factor makes it extremely important for you to optimize your listing. Creative titles, keyword-rich content, engaging descriptions, and clear bullet points ranks the listing on the top. This is another crucial factor that the A9 algorithm considers while determining the product rankings. Amazon defines this as the dollar amount and number of the seller’s transactions that has occurred during a given month. While assessing the sales velocity, it compares the seller’s velocity with its competitors for the exact search terms the user has typed. The seller with the highest sales velocity win out. You must have heard many experts stressing to keep your item in stock. Ever wondered why? Well, that’s a key factor that the algorithm takes into account when ranking a listing. If it says – out of stock – know that, your listing is never going to make it to the top results. Amazon doesn’t like to miss out on sales. If your product runs out of stock, you are disappointing your customers and this is something that Amazon is not going to like it either. Besides displaying the top-selling and relevant products, the A9 algorithm also checks if the product has been aptly priced. However, this part can get a little tricky because A9 not only looks at the best price but also looks how well the listing has been represented. So, try to balance these aspects. The FBA (Fulfillment by Amazon) is one of the most valuable resources for sellers. 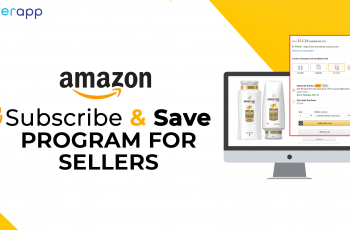 When you have your products stocked in any of the Amazon warehouse, it helps you achieve the status of “featured” merchant, reaching you to the Amazon Prime Members. This also increases your possibility of winning the Buy Box. 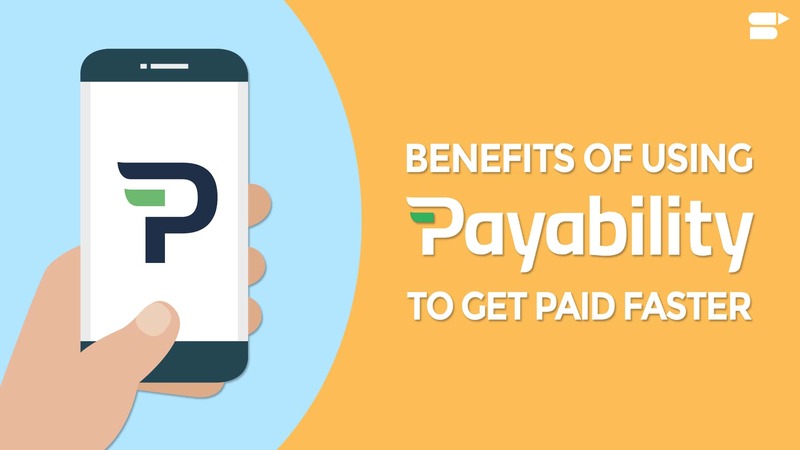 Together, these benefits pave a big way towards increasing the sales velocity and conversions. Sales velocity is yet other most vital factor that Amazon’s A9 search algorithm looks for. But the question how to increase your sales velocity? Well, the answer is through “advertising.” Even a few dollars allotted for advertising can do a big deed in driving visitors to your product listings. And if the product is impressive enough, you get to generate more sales. Undeniably, reviews play a key role in enhancing the overall sales. Positive ratings and reviews from customers help the A9 algorithm in determining whether buyers are engaging positively or not. To outshine in this part, create an incredible customer experience for visitors browsing through your listings. Attempt for favorable and good reviews while mitigating and minimizing the negative feedback. In an online marketplace where buyers cannot interact with the product physically, image is truly everything. Bright, clear, and high-quality pictures of a product with Amazon’s “zoom” feature enhances the conversion rate. Upload as many as acceptable images, taken in all angles, as this appeases the A9 algorithm to boost rankings. Amazon’s recommendation is to have at least 1280 pixels on the longest side. Ideally, you should go for ultra-HD images that have 2560 pixels (or more) on the longest side. Yet other best way to boost sales velocity and increase conversions is through promotions. A word of caution though. Discounting your product can provide a quick bump in sales, but it is not a long-term strategy for improving your rankings. There are many other more important, more sustainable “A9” factors to focus on – such as your text match relevancy and product availability. Using A+ Content (Vendor Central) & great Brand Content (Seller Central) results in a sales incline by 5%. Premium content gives buyers a better perception of the product, frequently resulting in lower returns and higher customer satisfaction. Make sure to follow the guidelines for every element related to your product listings, followed by optimizing and improving them to make it convert. This helps you outrank your competitors, add value, and increase your customer base. But, What We Did First? To build a best product listing, you should learn from the top sellers. At SellerApp, we knew that there had to be an essential difference between a not-well-optimized listing and the top-performing listing. With our set of tools, we not only figured them out but also will explain the key tricks to optimize to improve your rankings. 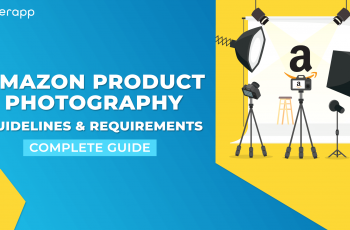 Of course, your product images should be clear, high quality, and extraordinary to help you convert. But the question is how many images are you including? Not many are aware of the fact that 62% of the top listings tend to have at least 5 or 8 images. According to sellerapp’s findings, the sweet spot is 6 images. 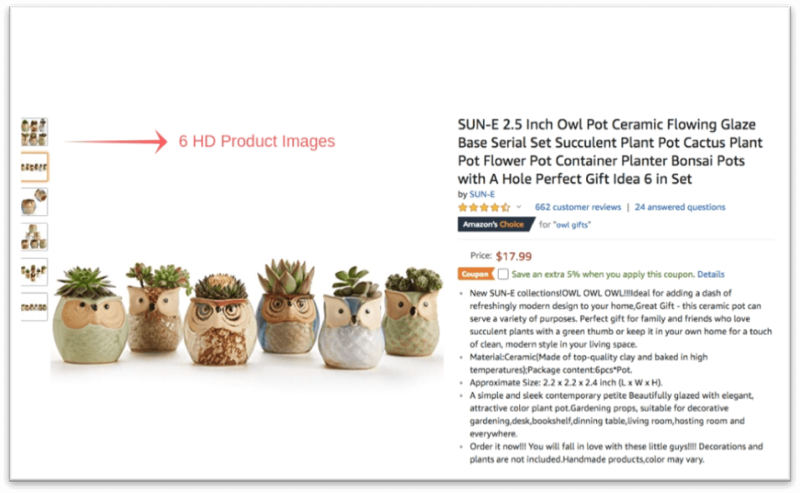 This was the product listing we took from Amazon and did a complete analysis on its images first. This product generates an estimated sale of 43 to 61 on a daily basis, with a decent revenue. Though multiple factors call for it, product image is one of them. When its images were analyzed, it scored a total 10. That’s because they had set up 6 high quality images in different angles, each taken on white background with clear light. This is indeed a wise move. The more a customer sees your product, the more they are convinced to buy it. Besides providing quality images, include as many pictures as possible. Also note that, many product categories let you to include swatch & alternate images. Though Amazon allows you to upload 9 images, we recommend you to stay around 5 – 6. Ensure that the main pictures are on a clear, white background. However, the background for others can be clean and simple. We tried to figure out the correlation between the product’s title length and the number of sales it generated. And yes, there was a relation between the two. A product listing that contains between 50 and 80+ characters generally top their place amongst 1000 products. Now, this literally means that your listing should contain at least 80 characters. That’s exactly what this listing has done. The listing has used 177 characters with all the potential keywords or search terms shoppers search for. Make a note that Amazon truncates every product listing to 112 characters. Hence, it is vital to take some time to work on the titles because it is one of the crucial factors that decides its CTR (Click-through Rate) on the results page. Undeniably, a good description reveals about a product better. It is more like a short story through which you pull customers. If a buyer gets to your product description, he/she is more likely to purchase your product, however are are still not sure yet. Different experts have different opinions in making a great description. But what it actually takes to create one? Well, it all comes down to creativity and optimization. A blend of both can improve rankings and convert better. The description has a direct impact on the customers. Tell them why you are selling the product for so much? Try convincing the buyers how your product can make a difference in their day-to-day lives and why is it important to buy it from you rather than your competitors. Considering the sample example, here’s what they have done with your product description. Again, it scored 10 points for its description. 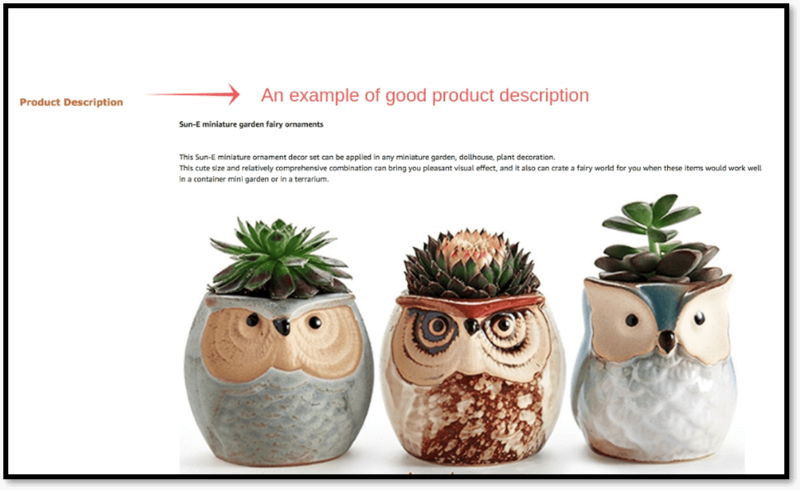 A product description should be concise, clear, and should be clear what in explaining what your product does. We recommend keeping it minimum of 250 words. But don’t make it too long either. Product features are one of the key elements of a product listing. They are usually listed using BULLET POINTS rather than chunks of texts or large paragraphs. This is because bullet points are simplified and easier to read than paragraphs containing lots of texts. And that’s exactly what this product listing did. It hit a complete score, proving that bullet points can do wonders in conversion rates. 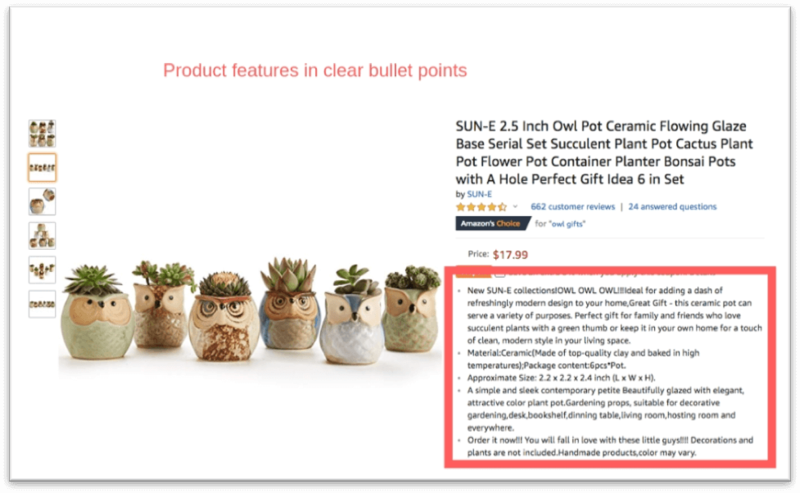 Upon analyzing, we also found that most top sellers on Amazon not only use bullet points to write their product’s features but also don’t overdo it. They do not exceed 5 bullet points. The bullet points must include every important feature that distinguishes from your competitors. Keep it interesting and convincing enough for a buyer to make a purchase. Also Read: How to write bullet points that it sells? A product’s reviews have a direct impact on the ratings. They go hand in hand with each other. So, the more the reviews, the higher are the ratings. The below listing has 4.3 ratings out of 5, which is certainly a good score but there is still a room for improvement. As far as the score is considered, this example listing got 8.6. One of the best things about our tool is that it is not only convenient to check if your listing is properly optimized or not but also highlights with quick tips to improve the score. That’s exactly what has happened with this listing. You can see a highlighted button that read – How to improve. Look for patterns in bad or negative reviews. What’s the common thing that your customers are complaining about? Then, come up with an idea or solution to fix it. Gather as many feedback as you can via email campaigns (automated) because this can at times, help you resolve the issue before a customer leaves a bad review. Accumulate as many reviews as possible and balance them so that you can have a good rating and review overall. A successful product listing tends to have between 500 and 1000 reviews. No wonder this product listing is generating a good amount of sales on a daily basis. It has more than 650 reviews, most of which are positive. Undeniably, most online shoppers rely on product reviews. Hence, it is important to encourage your customers to leave their honest opinions on your product page. So, here is an interesting fact that experts had to say. Products with 4.3 stars and 400 reviews are certain to perform better (in terms of sales) than products with even 4.8 ratings and 14 reviews. If a shopper is willing to purchase your product, your reviews have the potential to influence him or her to make a purchase. So, the higher the reviews, the better it is. 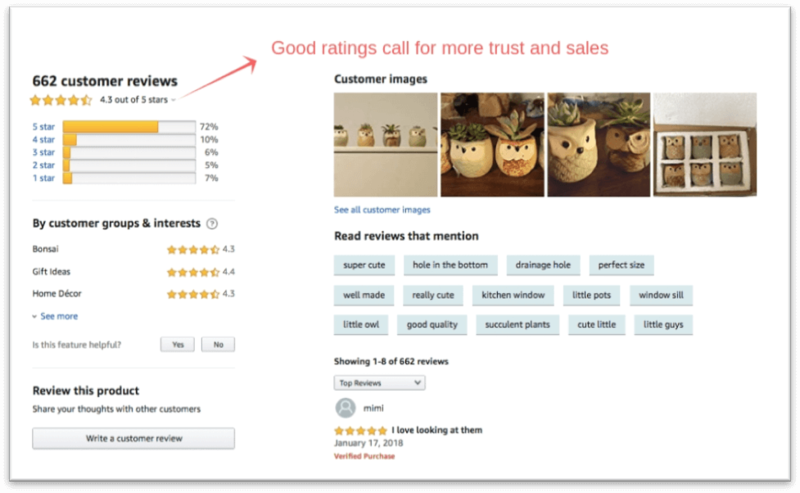 You can try running automated e-mail services, or use Amazon’s Reviewer program to gather a few initial reviews. If you sell your own product, you should create a new listing on Amazon. 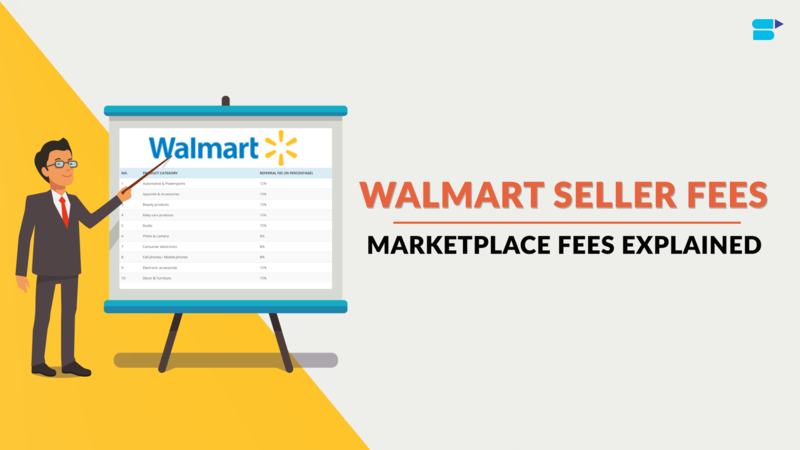 This means that you are the first seller to sell that product in the Amazon marketplace. If you have multiple merchants selling the same item that you do, then they share a common Amazon listing. You have to use the same and shouldn’t create a new listing for it. 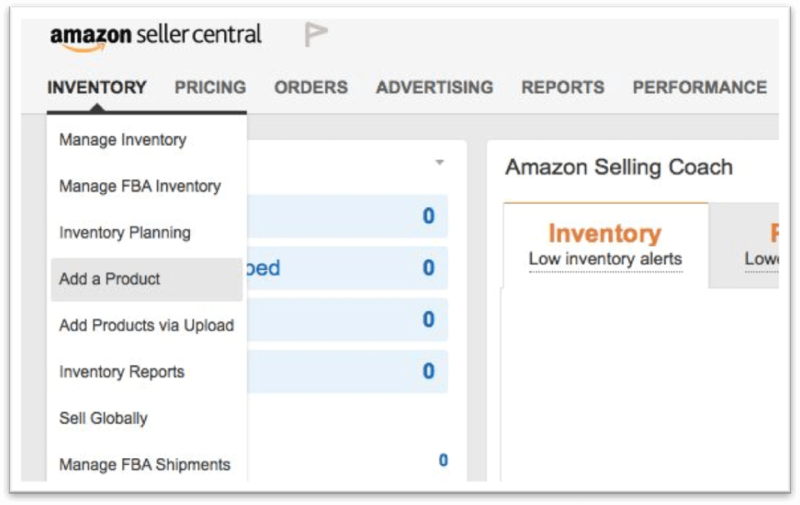 Step 1: Login to your seller central account and go to the dashboard. Step 3: A sub-menu pops up. Click “Add a Product” from the list. Step 4: You will be redirected to a detailed page where you can add the product. Step 5: Here, you will have the choice to either select an existing item or create your own. You can search from the Amazon’s catalog or “Create a new product listing,” if the item that you sell is unique. Step 6: Choose the product category and subcategorize to classify the item that you sell. Step 7: Once you choose the appropriate product category, you will be enabled to fill the product listing’s information. Step 8: You will be asked to fill the product title, product description, product images, and so on. Now, this is the part that can make or break your listing. The details that you give should be engaging and yet informative. Most importantly, it should be convincing enough for the buyers to purchase your product. Step 9: You will have to fill details in every tab named Variations, Offer, Images, Description, Keywords, etc. If you see a red warning symbol on any of these tabs, it signifies that you have missed entering the essential details required to make the listing available on Amazon Marketplace. Until you don’t do this, your listing will not be published. If you still face issues in publishing the product listing, you can always contact Amazon Seller Support team by clicking on the link – “Help” on the top, right side of the page. Follow the necessary steps to get assistance for the issue. 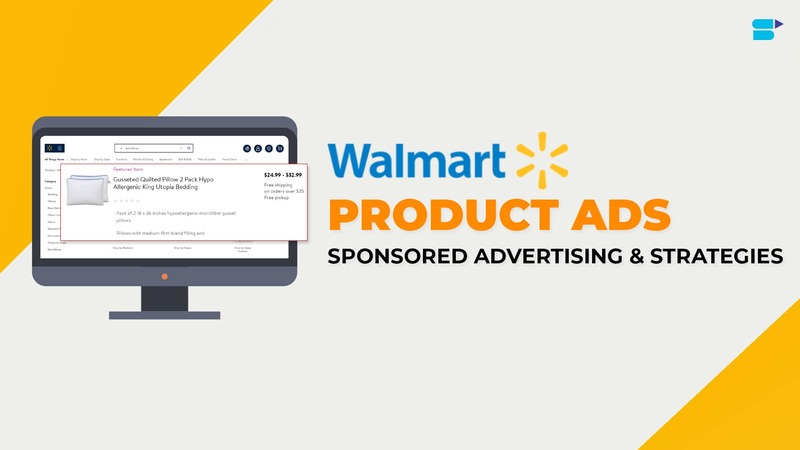 If you have shopped on Amazon, then you must have come across products that would have included a video about their product. This is actually a smart move and one of the best ways to convince a buyer to purchase your product, given that it is good enough and solves their day-to-day issue. Online shoppers like it if there is a video included for the product. 90% of them say that videos featuring the product help them in making the right decision. Product listings with videos tend to have higher conversion rates because shoppers feel that videos help explain the product benefits and features much better. Now, as a seller, if you are trying to add a product video to your listing along with the images, then it is simple. But first learn what type of videos are there and what each type contributes to. Generally, there are 3 types of video concepts that you can create to help your product reach the right audience and keep them engaged. Product Highlighter Video: This type of video is clean, simple, and features completely on the product. They are usually a 360° video with the product on a plain, white background. Customer Experience Video: This type of video is usually captured by the reviewers, fans, or customers. It offers a realistic experience for other buyers to comprehend the product better. Product Explanatory Video: This type of video is of impeccable quality with an engaging script and explains the benefits of using the product. Note: The option of adding a product video has been enabled for brand-registered sellers. However, there hasn’t been any official announcement yet. The option is just made accessible in the Amazon Seller Central under EBC (Enhanced Brand Content) menu. Unless you have a vendor account (not just seller account), you will not be able to add a product video and this is something you get only through an invitation. Make sure that you have the copyrights to the product video that you are going to upload. A product video should be created with high quality resolution. The product video should either be in its usual YouTube orientation or with 16:9 aspect ratio. The product video should have a minimum resolution of 1280 × 720 but the ideal resolution is 1920 × 1080. The product video should be recorded with a RGB (Red-Green-Blue) color profile with 300 DPI. However, 72 can be acceptable. The product video cannot contain multiple brand logos. It has to be only one. The video should be in of any one of these file formats: MP4, MOV, FLV, AAC, AVI, 3GP, MPEG-2. Even if you have created using Apple ProRes, you have to convert it before uploading. The thumbnail image of the video should either be in PNG or JPEG format. The video’s thumbnail image should be of high quality. The product video cannot contain your contact information. The product video cannot contain distributor or company or seller details. The product video cannot contain your competitor’s products. The product video cannot contain your status showing that you are an authorized seller or it is solely sold by the authorized resellers. The product video cannot contain product’s price. The product video cannot contain descriptive promotion information (e.g. on sale, hot selling, affordable, etc.). The product video cannot contain time-sensitive information (e.g. hot this year, on sale now, new item this year, etc.). The product video cannot contain timeline or shipping cost details. The product video cannot contain anything that shows it can be used for criminal activity. The product video cannot contain information about customer reviews. The product video cannot contain third party or editorial quotes. The product video cannot contain guarantee or warranty details. The product video cannot contain brand logos that you don’t own. The product video cannot contain links to any website other than Amazon. The product video cannot contain perverse or offensive content. Bear in mind that Amazon keeps updating their product video guidelines. So, make sure to look at the EBC’s help page or directly go to the link that says Video Guidelines within the EBC UI. How To Add A Product Video On Amazon? Step 1: Login to your Amazon Seller Central account. Step 2: Go to the EBC tool. Step 3: Enter the product’s SKU (Stock Keeping Unit). Step 4: Click on the button “Get started” to add the video to the respective ASIN. Step 5: Upload the video file. Step 6: Add the thumbnail for the product video, title, and description. Step 8: The process of adding a product video is now done. It takes a maximum of 6 hours for the video to be available on the product’s page. Once it is published, it shows up on the image block on the upper left pane, and again, in the related videos under the product’s information section. Step 1: Go to the EBC dashboard. Step 3: Submit the required changes. Step 4: Once submitted, your uploaded product video will be removed in 6 hours. How To Optimize Your Amazon Product Listings? The higher you rank, the more you sell! To rank higher, you definitely need to know and understand what is “optimization” is all about. 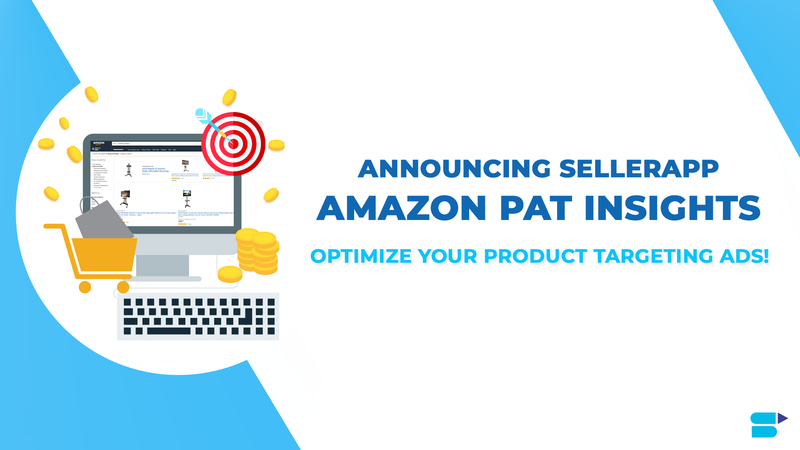 Amazon product listing optimization is a process where you optimize your listing to help impact organic rankings and sales. Most product listings that you see on Amazon aren’t optimized correctly. The sellers either do not know what it is or fail to understand how it is done. Whatever the reason is, it is vital to keep your listing optimized to boost more sales. Optimized with potential keywords to help rank for search terms that buyer search for. Optimized with right set of images, title, and description to generate greater conversion rates. Now, what most sellers tend to forget is the concept behind Amazon’s A9 algorithm. Even though you have an incredible listing that is well optimized for Amazon, if a buyer feels that “it isn’t good,” then he or she is not going to buy it. This is obvious. It isn’t just about an optimized product listing. It is also about your product’s quality, its features, and what customers think about it. Everything has to come together to make your listing successful. When you say “optimization,” it is not only about accomplishing higher rankings on Amazon’s search results. It is also about building a better and rewarding product overall. While #1 is completely in your hands, #2 and #3 is also something you can do but in partial ways because it’s the A9 algorithm’s job to get it ranked. However, you can work on the optimization part to enhance your listing in the search results. Fact: If someone seeing your listing gets the idea what you are selling, and finds it interesting in under 5 seconds, then know that the ladder to success is for sure. But if they don’t, then it might not work as expected. If you impress them with these four, know that you are half way through the process. The rest where comes the optimization part. If you hit these details right, you can easily convert 90% of the users. Now, before you could actually get into the actual “optimization,” there is an important step that you need to do, which is keyword research. 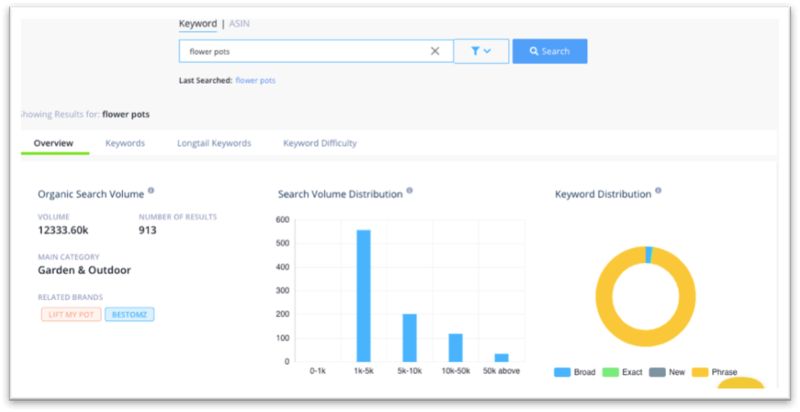 Though you have Google Keyword Planner handy, it is best to have a keyword tool that only gives the stats of what buyers are searching on Amazon’s search box. 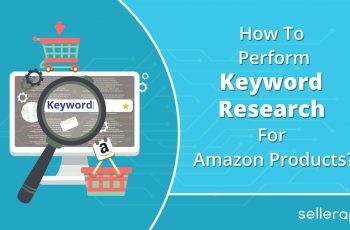 Though this is completely your freedom of what you want to go with, our “keyword research” feature can discover some of the top searched keywords on Amazon in no time. You can search for potential keywords based on the product that you are selling. Type the product category or product that you are selling on Amazon. You will get a detailed list of keywords associated to what you have typed and its stats. You can even track a few related products if you want to. The tool is that simple. 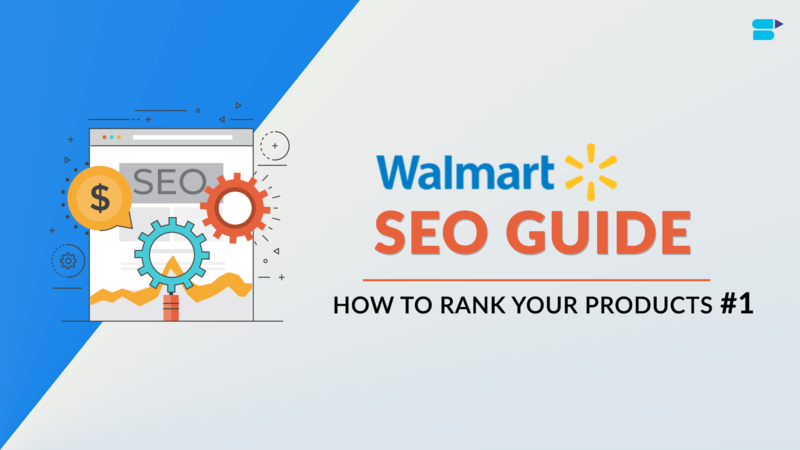 It also allows you to search for long-tail keywords and its difficulty to rank on Amazon. Once you decided what keywords you want to target, the next step is to optimize your listing. A product title is one of the most important elements of a listing. There are specific amazon product title guidelines to follow before writing one. If it is optimized and yet creative enough, it can instantly tell Amazon, buyers, and searchers what you are actually selling. There is a way to present this. Including important keyword elements in your title copy can help your listing to be “clicked.” Make sure you follow the below checklist while writing a title. Include potential keywords in the title but use dashes (-) or pipes (|) to break the keywords. This improves readability and doesn’t look confusing. Use primary keywords or search terms while including long-tail variations. Include USP (Unique Selling Point) of the product. Do not go beyond 200 characters for the product title. Use connectors if possible (before or after the main keyword). Capitalize the first letter of each word in the title except the, or, and, a, for, in, an, with, over. Include color, model number, series, and quantity (if required). If the product is a multipack. Mention the quantity. Example: 15-pack, set of 5, etc. Capitalize all the words in the title. Include particular details of your listing. Example: Free shipping. Use special characters or HTML tags. Key benefit of your product + primary keyword + for < person or type> | USP + Function + keyword (if you couldn’t fit in earlier) – Brand Name + secondary keywords. The product features are listed in clear bullet points to make it look attractive. This is the part that buyers read if they are making a decision to buy your product. Bullet points must clearly convince the buyer as to why he/she should buy your product. List the most important feature of your product on the first two points followed by the less important ones. Use only 5 bullet points. However, if it is really important to write a little, extend to 6 but not more than that. Incorporate call-to-action words in these points. Make sure that the first letter of every bullet point is capitalized. Include points that help distinguish your product from your competitors. Use a few keywords. But don’t just shove them. It should be sensible while reading. Use too many keywords unnecessarily. Use exclamation marks to 3-4 full stops. Use too many bullet points. Include shipping or promotional information in bullet points. Quality and clear product images help in increasing the sales. This section is a great way to showcase your product to your potential buyers. Therefore, quality in every picture matters. 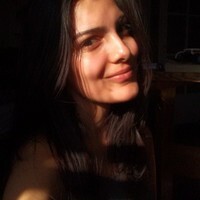 Every image should be clicked in bright white light. Focus the product at the center. The main image should only include the main product. It shouldn’t have accessories, box, or other items with it. Keep the image background white. Make sure that the image is large enough to allow the zoom function to work. Include a tagline to explain the durability of the product. 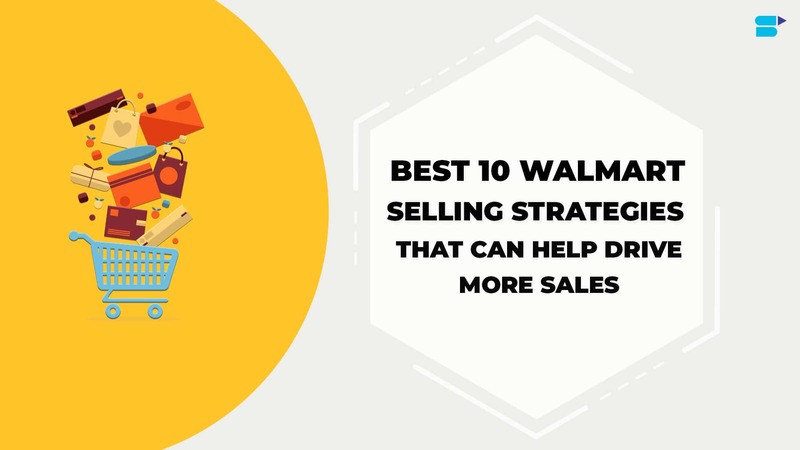 Include an infographic about the product’s benefits to help generate more sales. Make sure to use only JPEG (.jpg) file format. Keep the resolution 72 pixels per inch with a minimum size of 1000 pixels (for longest side). Include logos, texts, or watermarks on the images. Show multiple pictures if the product is a multipack. Include a background on the main image. But it is okay if you are doing for any other secondary image. Show various views of a product in the main image. Include accessories and other things that you are not selling with your product. A good, precise, short, and clear product description steals the deal. You should be creative enough to convince them that your product will solve their day-to-day issues that they are facing. 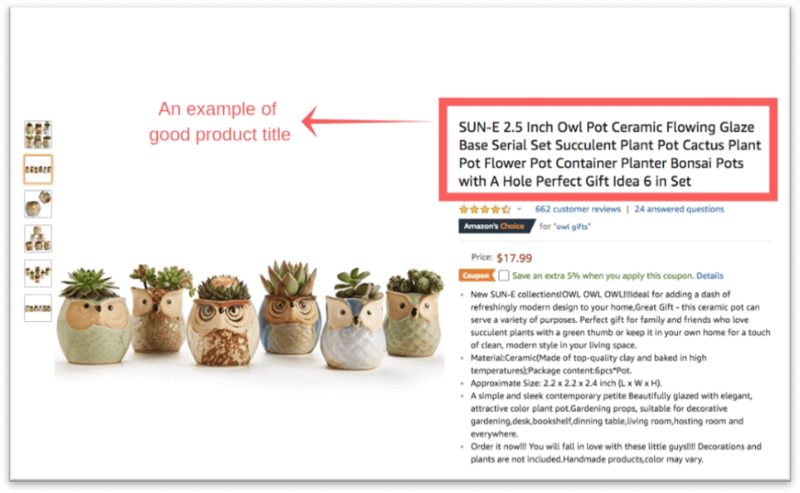 Though product descriptions are shown on the detail page, they also feed into Amazon’s search results and other external search engine results. Keep it short, clear, and precise. Give descriptive and factual information. Capitalize the first letter of every sentence. Give a page break when writing a new paragraph. Check for grammatical and spelling errors. Include brand name, model number, and series even if they are used in the title already. Include color, size, and compatibility information. Include shipping or promotional information. Include email or web address here. Use symbols or special characters. The section – search terms – is shown only in the listing’s back-end. There is still a whole lot of discussions around this part, but it isn’t that complicated. All you have to do is to put your main keywords, one per line. Use other primary keywords that you couldn’t use it in the product title. Include a few other secondary search terms. Include keywords that you have already used in the title. Use brand name again here because amazon will pick this up automatically. Use misspellings of the product or any other variant. Include any detail that causes misinterpretation of the product.